So, I picked up a set of 2000 GM 16 inch alloy wheels for my 1989 CV. Lo and behold, the center caps dont fit due to the hub length. Anyone else running this setup? If so, are you running spacers? Best solution is to do the big brake upgrade. Some caps are so close a minor tweak can make it fit. I'll look into some different caps first. For your CV, the same era Explorer center caps should fit and I believe do not require "modifying" the hub dust cap like the Mercury caps do. And not the stock box turbine lug nuts either. Last edited by VicCrownVic; 01-28-2019 at 10:17 PM. I'm pretty sure my car came with the wrong lug nuts (acorn style, no collar) on my Turbine wheels. For the short term, I replaced them with 15" snowflakes (winter tires, snowflake rims, makes sense, right?). 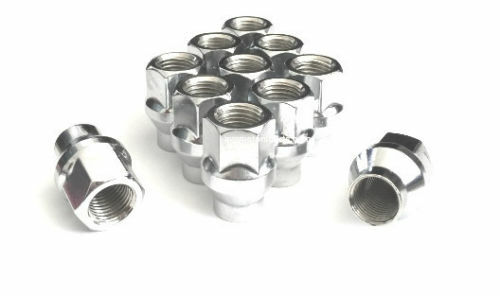 In spring, I want a set of the correct Turbine lug nuts...which ones are those? On topic, though: the snowflake center caps don't fit either, but I think a little denting of the bearing cap will work for now. Alloy wheels... Sorry, I had steel wheels on the brain for some reason. In that case, big brake upgrade is probably your only option to get the stock center caps on for alloy wheels. 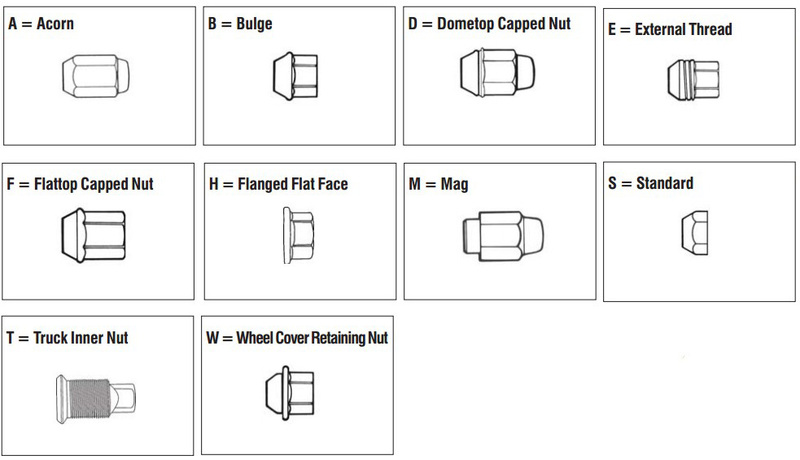 For box turbines the lug nuts are short, or according to Dorman's chart below they are standard. The main thing to look for is the thread pitch, which is the same on all Panthers '79-'11 and the same on many Ford products. 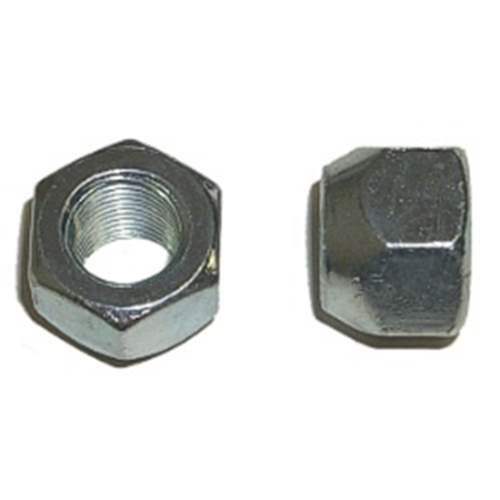 The lug nuts for box turbines are shorter than the lug nuts for box steel wheels. I'm not sure why, perhaps the taller lug nuts interfere with the center cap? I think the catalogs are wrong. The stock lug nuts on my turbines are standard style but longer than standard lug nuts. I’ve been looking for a set for a year or so but can’t find any aftermarket ones. Longer acorns will work fine. I'm running spacers on my Marquis and had to buy open lug nuts cause the car had HPP wheels so those are covered lug nuts. They catch the threads much better. Luckily I had some M14 lug nuts from my CTS for the rear spacer cause that one wasn't 1/2x20 like panthers usually have. That wouldn't surprise me if the catalogs are wrong. I've ran in to that with the studs that bolt the cats to the stock box exhaust manifolds. I'm sure we can come up with a set of stock turbine lug nuts here in Detroit no problem. Plenty of boxes in the yards still around here. Finding a complete set of 20 in nice shape might be a bit of a challenge but doable. I think Pvt.Hudson is the best solution for the OP outside of a big brake upgrade. Last edited by VicCrownVic; 01-29-2019 at 07:55 PM. I think I'm okay, then. The standards and the acorns are the same cone, face, thread, etc...but the acorn gives me a lot more meat to grab with my lug wrench. The caps are ginormous and held on by three little conical stud pieces, I could probably use the "truck style" long acorns with room to spare. I was more concerned about whether the taper was the same, the lug-to-wheel area on the Turbines is (visually) a little different than newer alloy wheels and I certainly don't want to damage the wheels (or me!) by running incompatible parts, especially when lug nuts are comparatively cheap. They're under the cover, so I don't care whether they're factory correct. I agree. You zip one of those bastards on and the head will be almost flush with the face of the wheel. Not conducive for future removal. Ive seen it before in the yards. Looking through what others have posted, pretty much any wheel other than what was offered from the factory is going to have issues with center cap fitment. A buddy of mine has 16"/17" staggered Torq Thrusts on his '67 Mustang. I'll try one of his wheels for fitment. Anyone in Southern California looking for some '98 MGM Alloys? Last edited by DSander; 01-31-2019 at 06:23 PM.